Northern France; Middle 15th Century. Latin Text; Angular Gothic Script. 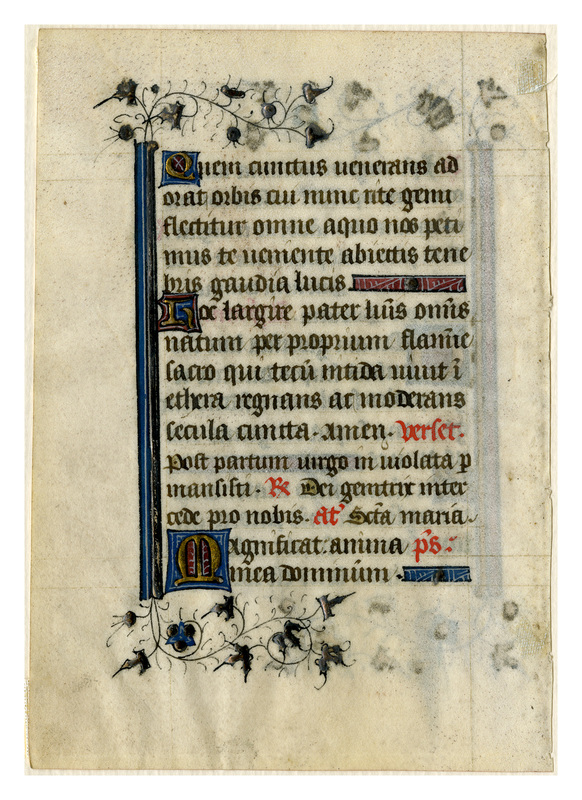 This Book of Hours shows definite characteristics of the manuscript art of France and the Netherlands of about 1450 A.D. It was probably one of many copies prepared for sale at a shrine to which devout pilgrims came to worship or to seek a cure. The spiked letters and the detatched ornamental bar are unmistakably Flemish in spirit, while the free ivy sprays are distinctively French. The burnished metal in the decorations shows the use of alloyed gold (oro di metà) as well as silver. Various metals were added in different localities to the fine gold. English illuminations frequently had a decided orange hue, while the French had a lemon cast. The quality of the gold was best enhanced by the use of burnishing tools equipped with an emerald, a topaz, or a ruby. Less successful burnishers contained an agate or the tooth of a wolf, a horse, or a dog. The metal alloys have tarnished, and there is visible chemical deterioration of the vellum. Some of the leaves display smudging of the ink when still wet. Text: The leaves we have seen indicate that this Book of Hours accords with the Use of Metz; see especially Leaf 28 in the Kent State, Denison, Kenyon, and Lima portfolios for evidence. This leaf contains text from the Hours of the Virgin at Vespers, including the entire text of the hymn "O quam glorifica luce." Recto Translation: [Responses not yet translated.] Hymn. stock of David, royal offspring! Looking down on all the heavenly regions. from whence God took flesh, and was born Christ. coming before thee surrounded by the joy of pure light. ruling and governing for all ages. Amen. Verse. Thou didst remain an inviolate virgin after thy childbearing. R. O mother of God pray for us. Ant. Holy Mary. Psalm. Recto Transcription: R. Christi virgo dilectissima virtutum operatrix opem fer miseris subveni domina clamantibus ad te iugiter. V. Quoniam peccatorum mole premimur et non est qui adiuvet. Subveni domina. Gloria patri. Subveni. Hymnus. Verset. Post partum virgo in violata permansisti. R. Dei genitrix intercede pro nobis. Ant. Sancta Maria. Ps. 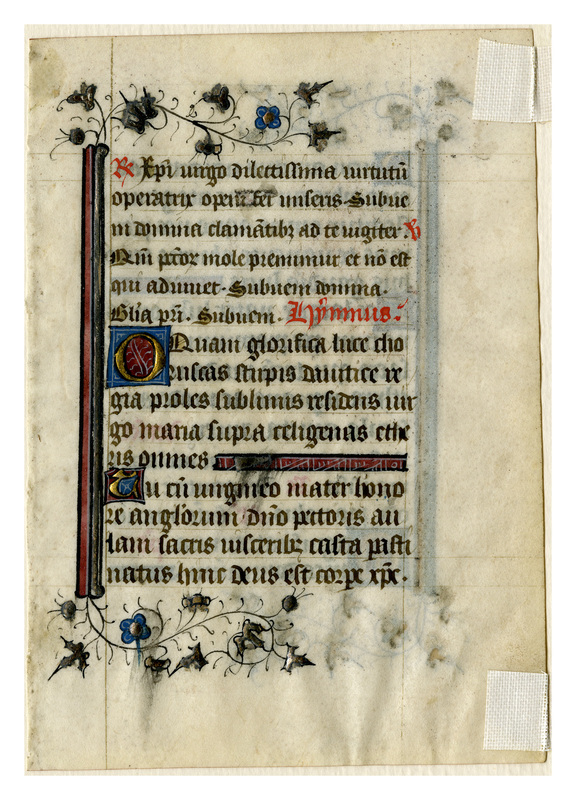 “E0028 Leaf from a Book of Hours (Horæ Beatæ Mariæ Virginis),” Digital Exhibits | Denison University Archives & Special Collections, accessed April 23, 2019, http://exhibits.denisonarchives.org/items/show/50.